Sephora has a new promotion! 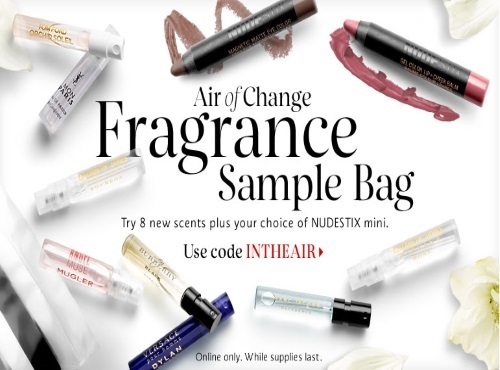 Get a Free Fragrance Sample Bag with any online purchase of $25 or more for a limited time. This includes 8 new scents and your choice of Nudstix mini! Enter the promo code INTHEAIR at checkout. I don't know what the matter is with Sephora Canada's checkout page, a lot of promo codes are not working lately. I tried it this morning and it wasn't working already so I didnt blog it, but thought it was maybe just mes so I blogged it now. I think it's a tech error on their end. I wrote to customer service about it.